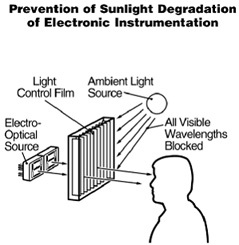 Privacy filters, sometimes also known as light control film (LCF) such the 3M Vikuiti A-LCF and Optical Filters K-LCF consist of many thin louvres that function like a vertical window blind restricting the path of light through the filter. The display is clear and un-distorted to the user directly within the viewing axis, but to either side the image is blackened and un-readable. There are a number of applications for displays where privacy for the viewer is required such as an outdoor privacy screen in an ATM, medical kiosk, in-flight entertainment screens and polling booths. Other applications are for contrast enhancement and light control such as pedestrian crossing units and head down avionics where the re-directed light limits the near field canopy reflections. Privacy filters are offered either as standard plain or non-glare matte hard coated polycarbonate filters typically 0.5mm (0.021") thick precision cut to final size, laminated into glass or plastic for thickness and extra ruggedisation, or integrated with a touch screen. Lamination with glass or plastic adds the options to have anti-reflection and anti-finger print coatings, chemically toughened glass and EMI shielding. 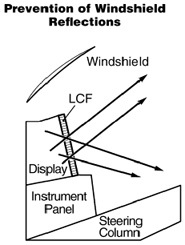 The K-LCF is a high value alternative to the 3M product. 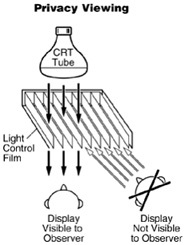 The privacy control is the same and the filters construction is similar to previous LCF-P types.